This lab gives you what appears to be an obvious primary goal: to capture all frames sent within VLAN 2. However, that requirement coupled with the secondary goal of capturing no more messages than is required sets you up for a common mistake: capturing frames in both directions. First, the suggested answer creates a monitor session number 2, monitoring frames received on ports in VLAN 2. That means that any frames the SPAN session will capture frames received in (a) access ports in VLAN 2 or (b) trunk ports with the frame tagged as VLAN 2. The danger is to consider using the both direction, that is, for frames both sent and received. 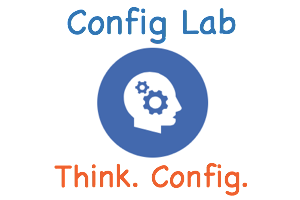 If you configured this lab and instead used a direction of both, SPAN would capture each frame twice. 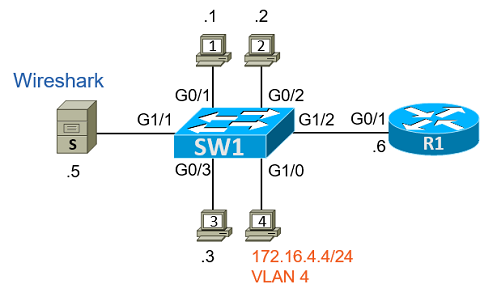 For example, a frame sent by PC1 to PC2 (both in VLAN 2) would be received in G0/1 (an access port in VLAN 2) and forwarded out port G0/2 (an access port in VLAN 2), so SPAN would capture at both points. As a result, the two best answers for the SPAN source are either the answer listed in Example 3, or the similar monitor session 2 source vlan 2 tx global command. The monitor session 2 destination command simply references the outgoing interface, which should point to the interface connected to the host that is running wireshark.